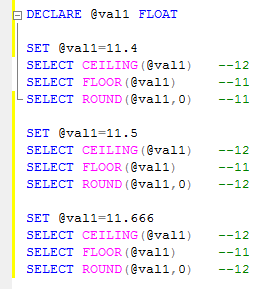 In SQL queries sometimes we need to round off some decimal or float values, at that time we always think that which option to be applied while we have three different kinds of system defined SQL rounding functions-Ceiling, Floor and Round. Get the value on the right side of the decimal and returns the smallest integer greater or equal to, the specified values. Rounds a positive or negative value to a specific length.